Late last month a friend of mine asked me if I would be willing to make a cake for a fundraiser and what I would charge her. I said I’d do it for the ingredients. Heck yeah, someone else to help fund my new found interests. I don’t know, do you call it a hobby? A job? Perhaps we stick with interest? I don’t really know the answer. The thing I can tell you though is I really like decorate these types of cakes. Piping like you learn in Wilton classes aren’t really my thing. Too stressful. Wedding cakes are too stressful too. Truthfully I could have had a “moment” with this particular cake. But that was okay. I relaxed and continued on. It was easier that way. And in the end, it worked out. Don’t worry, I’ll explain. I mulled over my options quite a bit. It’s fall. I wanted the cake to scream fall. So there are pumpkin, apples, s’mores. Ooooo s’mores. Truthfully I’m not a fan of s’mores, but a lot of people are. So what kind of cake portray’s s’mores? Bigger Bolder Baking Gemma came to my rescue. 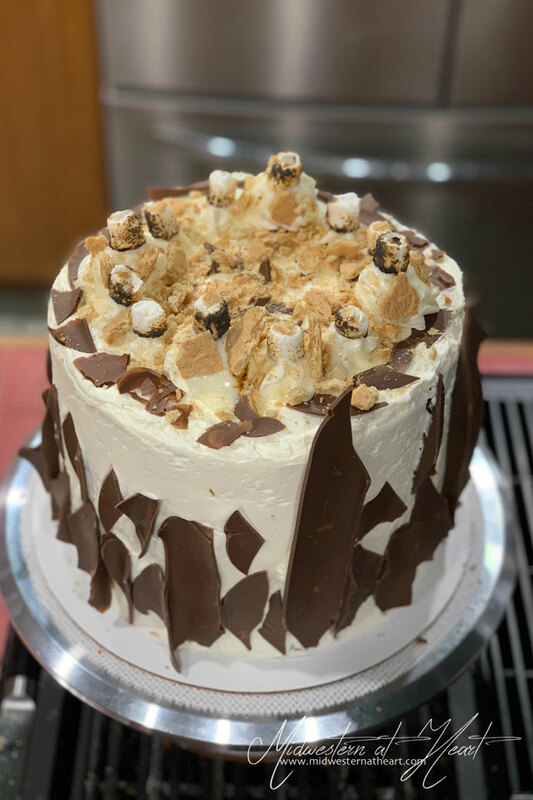 She recently posted a video/recipe for a S’mores Cake. She used Marshmallow for the topping. Can that stand up to being out all day? I don’t know. That and I didn’t think hers was all that s’mores pretty looking. So what about Swiss Meringue. Ooooo Swiss Meringue. I like a good Swiss Meringue Buttercream. This is a newly found taste.